Jewelry was once a fashionable way of showing one’s well-being and fortune by using intricate designs and the most expensive and exotic materials available. These days, it still retains part of that function, but its aesthetic purpose became so important that everyone wants to wear some sort of accessories. Thanks to cheaper materials that imitate the expensive ones, it is now affordable to own a lot of different items, in order to have something to fit each of your dressing patterns. Read the following reviews to see some of the coolest and most affordable accessories available these days. This necklace is one of the most appreciated designs thanks to its wonderful aesthetics and adjustable size, as well as the vintage look and the fact that it is hand-crafted. 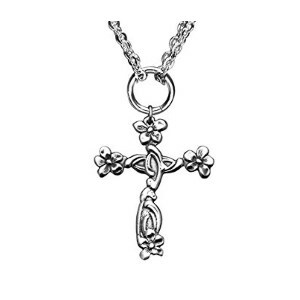 Made by using patterns found in antique silverware, the cross is fabricated with a base metal and is silver plated, therefore keeping it at a lower price. The chains on the product are adjustable from 16 to 18 inches, while the pendant itself measures about 1-5/8″ by 1-3/8″. Quality and value are characteristics of this necklace. It can be offered as a gift as well on many different occasions such as Christmas or other holidays. There are many other accessories that go well with this one, manufactured by the same artists. Celtic-themed jewelry has become more and more fashionable in the latter days, aided by the growing popularity of medieval TV shows and movies, and also by the fascination generated by Nordic cultures. Pepi offers you a good looking Celtic knot at a low price, perfect as a gift for someone you care about. The pendant is made out of Excelsior pewter, without nickel or lead, so it has fewer chances of triggering an allergic reaction. 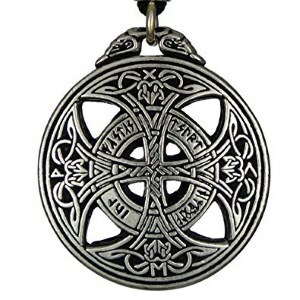 It depicts a cross, while the circle represents the unity of all life; the runes carved on it translate as the seeds of love grow in trust, making this a perfect gift for your significant other. It is double-sided and comes with an adjustable cord measuring 30 inches with laminated ends. Overall, it measures 1 and 3/8 inches in diameter. Another particularly popular symbol, adopted from ancient cultures, is the tree of life. It can be found on many pieces of jewelry, both old and modern, and it is central to some religions. The pendant is made out of recycled glass, making it eco-friendly and a perfect gift for those who militate in favor of recycling. The necklace, made by Moneta Jewelry, is known for its high-quality build and the attention to detail of the manufacturer. It has an adjustable cord that can be stretched to measure up to 28 inches in diameter. The intriguing pendant attracts attention and, besides, it is eco-friendly and helps the artist who designed it. Astral themes are appreciated these days and ever more fashionable. 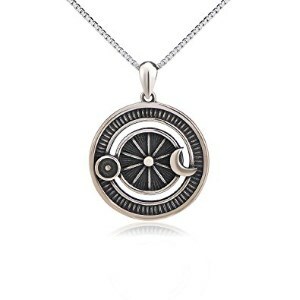 This Sun and Moon pendant is the ideal gift for your girlfriend, as it is made out of 925 Hypoallergenic Sterling Silver and is nickel free. This beautiful design features a series of concentric circles and the Sun and Moon orbiting each other. It is small, measuring about 1 inch in diameter so that it can be easily worn with any outfit. It can be sent back in case that the buyer is not satisfied with the quality, so returning it is no problem. The chain measures 18 inches in diameter and cannot be adjusted. Since it is silver, a few protective measures have to be taken: it must not come in contact with harsh chemicals and should be regularly cleaned to maintain its shine. A lot of people turn to aromatherapy these days, to relieve stress and to help them relax. 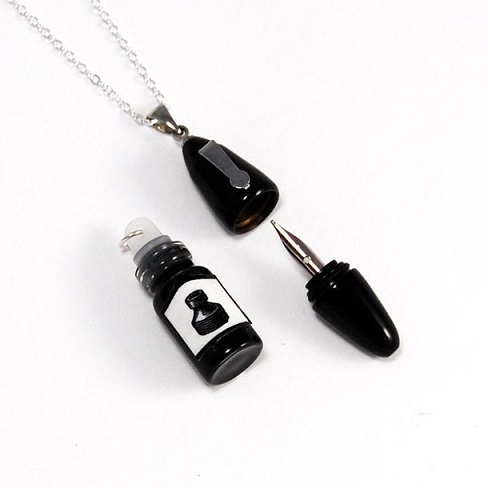 Combining this with fashion, Boutiquelovin manufactured a pendant that diffuses essential oils. Featuring a tree of life design, it incorporates a small reservoir where one can store a few drops of substance, enabling him to benefit from aromatherapy all day round. 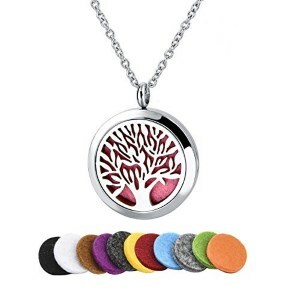 Titanium steel was used for the locket and chain, while the tree of life itself is made of stainless steel. It has two magnets to seal the tank, so no oil drips on your body or clothes. It has an easy open up and closing system, to make it easy for you to change the oils. This is a perfect and inexpensive gift for Mother’s Day. The necklace is an easy to wear everyday item, not too fancy but still beautiful and elegant. A special gift box is included by the seller, so you do not have to worry about that anymore. Made out of base metal, it also includes some small, high-quality crystals on one side. 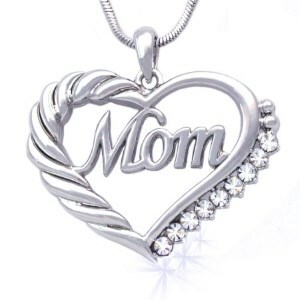 It has the word MOM engraved inside a heart-shaped symbol and a knot-resembling pattern on the opposite side. The chain is 17.5 inches long, and it is not adjustable. The overall sizes are 1.25 inches across and 0.875 inches high, so it is not too big but not yet small. 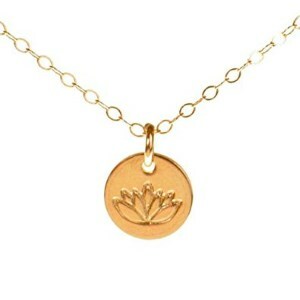 Lotus was used as a logo or emblem by many different peoples around the world, since the oldest times. This pendant has it engraved on a small circle, turning it into a perfect gift for a woman who prefers exciting designs. Made out of gold, the necklace is a little bit pricier. It is very small and delicate, so it is for those who like small and elegant jewelry. The hand-engraved charm is beautiful and represents blooming and beginning. It is accompanied by a 2-year warranty, even though the gold filled chain and pendant are made in such a manner that rubbing or peeling off becomes pretty much impossible. 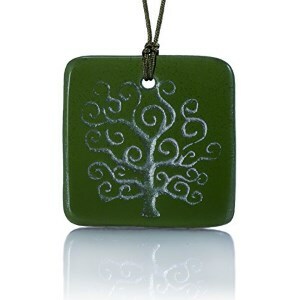 The tree of life is a popular symbol that comes in many different designs meant to satisfy a certain type of person. JOVIVI Vintage Tree of Life Pendant has it wrapped around a natural gemstone that can be worn for any occasion. 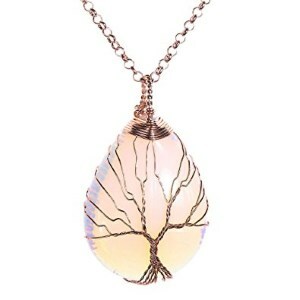 Made out of copper wire, the tree of life is wrapped around a teardrop shaped Opalite stone. The handmade item is perfect as a gift for your friends or family. It has an extendable chain measuring 28 inches and comes with a gift box and black velvet pouch. The high-quality build qualifies this design as one of the best out there in this category, while the price is affordable. 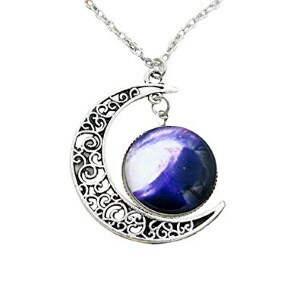 Many crescent-shaped pendants are available for sale these days. They are fashionable and appreciated by everyone for their simple yet easily relatable shape. This particular design also includes a cosmic-themed sphere, placed in the center of the crescent moon. The necklace is pretty exotic and original in terms of design and symbolizes peace, wisdom, and elegance. It can be easily worn in any situation, comfortable and it will surely attract attention. The chain measures 17.5 inches in length and is not adjustable. High-quality materials were used to manufacture this item – silver plated crescent and blue glass cabochon, yet it is available at an attractive price. It is known that women have a special bond with cats, and these felines are the most loved pets in the world. This is why this pendant in the shape of a cat is popular amongst buyers. It is inexpensive, pretty and perfect as a gift. 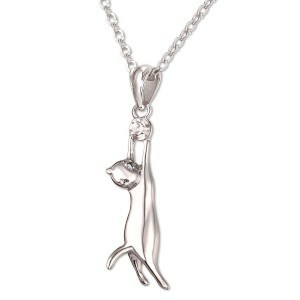 The necklace is made out of environmental friendly copper, it is platinum plated and has a rhinestone on the cat’s paws. A slide pendant and adjustable necklace make this item easy to wear. It is suitable for everyday use and also for special occasions. Also included are a black velvet pouch and a U7 design gift box. Since the beginning of time, people have been prone to wearing jewelry and precious items. A symbol of wealth and personal style, nowadays women are the ones that enjoy all sorts of necklace and pendants because they add a certain glamorous look to their overall outfit. Choosing the perfect jewelry that can compliment a certain style is a tad difficult but certainly not impossible. Especially necklaces and pendants are an important part of every woman’s jewelry collection due to their ability to create multiple looks with the same clothing items. Therefore, you need to get cool necklace pendants that look good on you. If you want to purchase a gift for someone, you must keep in mind their fashion sense and personal preferences. An ornament specially designed to be suspended from a chain or cord, the pendant comes in many shapes and sizes. There’s no need to start this search alone because our team of experts has already created a useful buying guide that you can use anytime you want to buy necklace pendants for your or your friends and family. Based on several indicators such as size, occasion, and fashion style, they’ve managed to offer you some important tips that you should take into consideration. The right necklace pendant can make any women feel more confident and attractive. This is why it is mandatory to check their quality by following a set of features that matter most. We’ve made the job easier for you by making a short presentation below that you should take a look. One of the most important decision you must take is the size of the pendant. With so many models for sale, you can find it a hassle choosing that special item that can be worn with several outfits. Once you determine the size, you can establish the other factors such as the colors that are used, the appearance of the person wearing the jewelry and the event the necklace pendant is intended to be presented. Pendant jewelry can be traced back to the ancient Mesopotamia, and the meaning of this word is actually related to the verb ‘to hang.’ Ancient Egyptians and Greeks used to craft sculptural designs and wear them around their necklaces. Extremely popular nowadays, pendant necklaces can be found in a wide array of styles and sizes, according to each person’s personal jewelry style. Large pendants draw more attention especially if you decide on a bright and shiny piece. Generally, you pick pendants in a bigger size when you don’t wear more than one color in the upper part of your body. Although this is not a rule, you shouldn’t’ choose something too bulky unless you want that jewelry to be the focal point of your outfit. 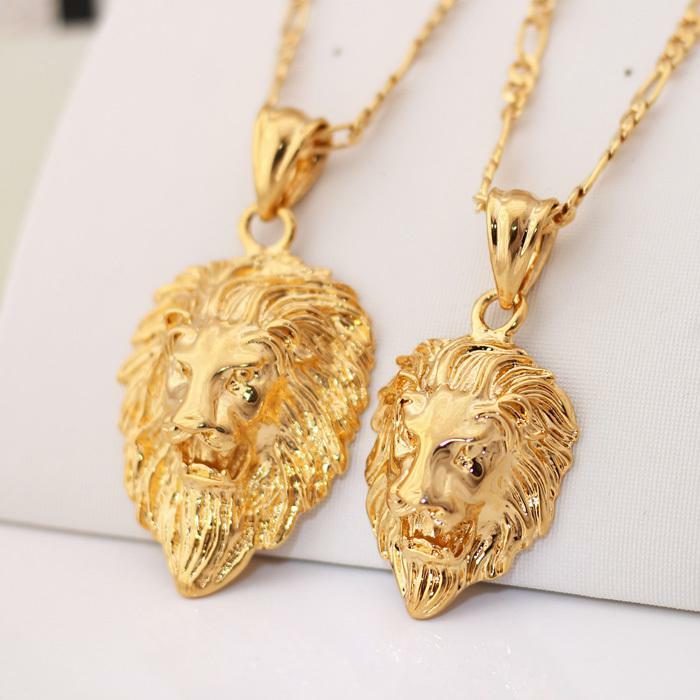 If you want to get beautiful necklace pendants, you pay attention to their size and the way it looks on your or on the person you intend to give it as a gift. A pendant that tends to stand out from the rest of your clothing ensemble should be worn with minimal jewelry, and the chain should be as simple as possible. Smaller pendants, on the other hand, can be used with almost any kind of outfit and for many occasions. You can choose a sparkling gemstone or a silver necklace heart pendant, and you already have a piece of jewelry that offers a sleek and stylish look for your day or night wear. The main reason people purchase pendants is that they are versatile and practical to combine. You can get as many as you like and exchange them according to your mood and color of your clothes. Basically, you need only a couple of chains in order to benefit from multiple pieces of jewelry. There are six main chain sizes that you can choose from. Perfect for a V-neck dress or a strapless top is the collar necklace that you add a small pendant. The choker is a little less tight, and you can create a unique look by adding small pendants that you can wear for both casual and formal occasions. The bigger the chain gets, the more you need to pay attention to the size of the pendant. Princess length is the most popular choice among women because it ensures plenty of flexibility and goes with almost any size of the pendant. Matinee, opera, and rope are larger and are more suitable for casual wearings. There’s practically no limit to how many pendant designs you can find on the market. You can purchase them in a multitude of sizes, shapes, and motifs. Depending on the person you are buying the necklace pendant for, you can opt for animal pendants that have birds, insects, dogs, or cats. These are a tad more unconventional but can be a great gift idea for a friend or a niece. If you need a pendant necklace for mom, you can give her a customized jewelry such as a monogram or an initial pendant necklace. Other cool options are the cross pendants, the solitaire pendants, and the teardrop pendants. If you like the idea of fine jewelry pendants, there are gold pendants and white silver pendants that look great on everyone, no matter their age. Gemstones are chosen by many women thanks to their color versatility, while diamonds are more luxurious and must be worn only at evening events. Many of these necklace pendants can only be worn for a formal occasion. This is the reason why it is advised to purchase adjustable chains that can help you make your piece of jewelry more practical to wear. You can keep the chain shorter for an elegant look or let it hang loose for a casual occasion. Simply because a pendant looks great it doesn’t mean that it is suitable for any type of event. Depending on the people you are planning to meet and the topic of the event you must dress and accessorize accordingly. Use your good judgment to determine the size and the style of the necklace pendant. A fashion style is like a resume that says everything there is to know about your personality. This is why, when buying necklaces for girlfriends you must consider other elements besides the size. The wearer’s hairstyle should be taken into consideration because it pendants draws attention to the face. Long hair might tangle in long chains and small pendants may pass unnoticeably.